March 25 – Cameroon, South Africa, Zimbabwe, DR Congo and Benin were among the teams to seal their ticket for the 2019 Africa Cup of Nations in Egypt in a weekend of frantic qualifying that confirmed a strong eastern African presence and a maiden participation for Burundi at the 24-team finals. The Indomitable Lions and Bafana Bafana were the last of the traditional powerhouses whose fate was still in the balance, but in their final group games they delivered three points to clinch a place in Egypt. The defending champions needed at least a draw against Comoros and goals from PSG’s Eric Maxim Choupo-Moting, China-based Christian Bassogog and substitute Clinton N’jie ensured a comfortable passing to the finals. 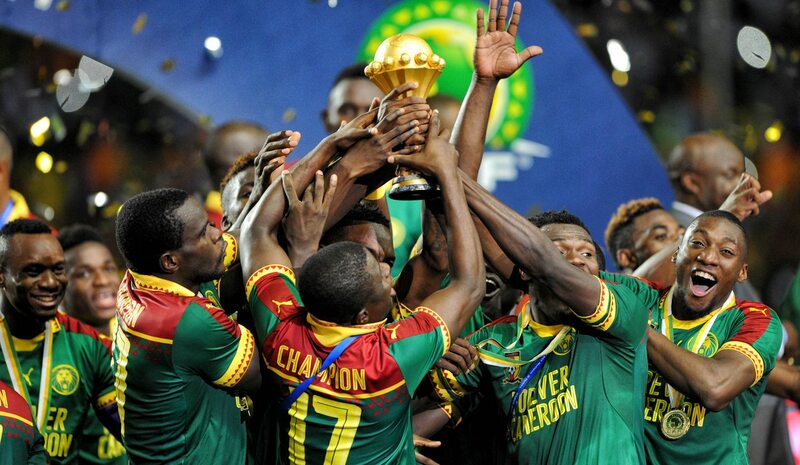 The Comoros Football Federation had previously filed a complaint at the Court of Arbitration for Sport (CAS) demanding the Cameroonians be excluded from the 2019 tournament after having the hosting rights for the tournament withdrawn by CAF over delays in preparation for the event. South Africa booked the last place at this summer’s expanded Africa Cup of Nations with a nervy 2-1 win against Libya. Percy Tau, on loan from Brighton and Hove Albion at Belgian second division club Union SG, scored a brace after the break to secure all three points for Stuart Baxter’s side. The Libyans had been forced to stage the game on neutral territory in Tunisia because of a FIFA ban to host international matches in the country. Tau opened the scoring after 50 minutes before Libya pulled one back from the spot, but three minutes later the 24-year old put South Africa back in control. Earlier on Sunday, DR Congo, Zimbabwe, Benin and Tanzania had also qualified for the tournament. The Tanzanians shattered Uganda’s unbeaten record in qualification with a thumping 3-0 win in a raucous atmosphere in Dar Es Salaam. The Taifa Stars return to the finals for the first time since 1980. They will mark a strong Eastern African presence at the finals alongside opponents Uganda, Kenya and Burundi, who made history holding Gabon and Pierre-Emerick Aubemayang to a 1-1 draw to qualify for the continental championship for the first time. In need of just a point, Cedric Amissi scored in the 76th minute for the hosts, but an own-goal from Omar Ngando with just eight minutes left to play had the scores levels. The Gabonese however failed to breach the home defense again and Burundi held on for a famous win in Bujumbura. The draw for the Africa Cup of Nations will take place on April 12 in the Egyptian capital Cairo. The tournament will be played in June and July across six host cities in Egypt. For the first time the finals will be disputed by 24 teams. The 24 finalists are Egypt (hosts), Algeria, Angola, Benin, Burundi, Cameroon, DR Congo, Ghana, Guinea, Guinea Bissau, Ivory Coast, Kenya, Madagascar, Mali, Mauritania, Morocco, Namibia, Nigeria, Senegal, South Africa, Tanzania, Tunisia, Uganda and Zimbabwe.